Jonathan M. Skarie MD PhD is a Board Certified ophthalmologist and fellowship trained glaucoma specialist, practicing as an ophthalmic surgeon at Ohio Eye Associates since 2017. 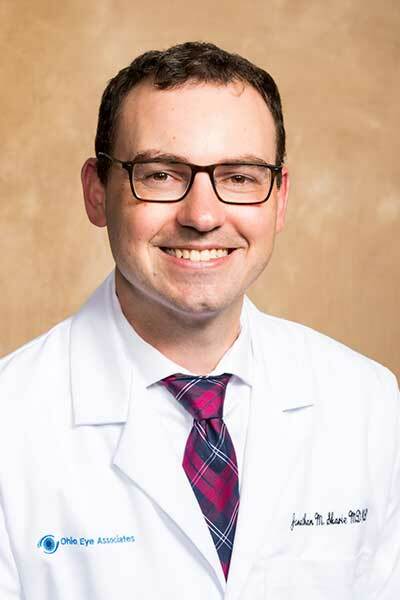 Dr. Skarie grew up in central Wisconsin and attended the University of Wisconsin- Madison, where he earned a bachelor’s degree in Biochemistry, graduating with honors. He then earned his MD and PhD degrees at the Medical College of Wisconsin in Milwaukee, with a research focus on glaucoma genetics. He stayed in Milwaukee to complete an Internship year at St Luke’s Medical Center and his ophthalmology residency at the Medical College of WI. He was chosen to serve as Chief Resident and received several honors, including the Jessica Lin Award for Clinical Excellence, given to the top resident from all specialties at the Medical College of WI. Dr. Skarie moved back to Madison, WI to complete clinical and research fellowships in glaucoma at the University of Wisconsin-Madison. He secured a prestigious HEED Fellowship during this time, focusing his research on optic nerve regeneration. Prior to joining Ohio Eye Associates, he worked at UW-Madison serving as a glaucoma and cataract specialist and educator, as well as a glaucoma research scientist. His specialty interests include cataract/implant surgery and all aspects of glaucoma medical, laser and surgical care. He is trained in the latest advances in glaucoma surgical care including several Minimally-Invasive Glaucoma Surgery (MIGS) techniques. In addition to his clinical practice, Dr. Skarie has a Visiting Scientist appointment at the Cole Eye Center at The Cleveland Clinic where he is continuing to pursue his interests in glaucoma basic science and ophthalmology education. He is also collaborating with geneticists at Case Western Reserve University to better understand genetic risk factors for glaucoma. Dr. Skarie is an active member of the American Academy of Ophthalmology, American Glaucoma Society and Association for Research in Vision and Ophthalmology. Dr. Skarie moved to the area with his wife, Emily Exten MD, who is a native of Mansfield, and their two young daughters. He is excited to be able to provide specialty glaucoma and cataract care to the Mansfield area.